When this station opened with the Sevenoaks extension of the Tonbridge cut-off line on 2nd March 1868, it was the absolute epitome of everything SER. Deep in rural territory, the platforms were staggered and the station structures were wholly of clapboard construction, both renowned SER trademarks. Like Grove Park, the station had been provided at the request of a landowner. The two platform faces were linked by a rather austere iron-lattice footbridge (to the same design as that which later appeared at Sevenoaks), but the canopies’ elaboration made up for the former’s shortfalls. The main station building was positioned on the ‘’up’’ side, and was built to the same general clapboard design as the example still in existence at Hildenborough. A rectangular flat-roofed canopy extended from the building, over the platform, and demonstrated an intricate pointed valance (see Plumstead). 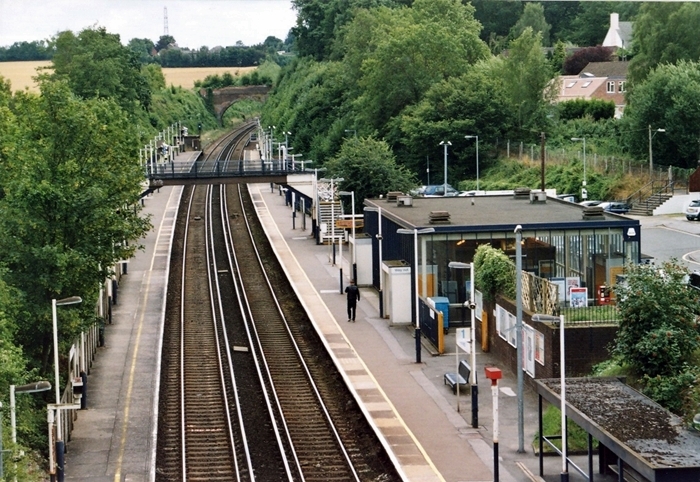 The ‘’down’’ platform was not host to a station building as such, but like Hildenborough, a canopy, identical in appearance to that extending from the ‘’up’’ structure, was in evidence. Providing copious coverage – and in style, too – the canopy was supported by five struts, and in the absence of a station building, a clapboard rear wall was constructed. Goods were not a feature of this station for some three years, a situation which was replicated at Hildenborough. After this period, a single southward facing siding was laid behind the ‘’down’’ platform, it terminating directly in line with the northern elevation of the waiting shelter. Over the subsequent two decades, goods provision increased noticeably: a ‘’dock’’ line appeared at the southern end of the ‘’up’’ platform, coupled with two ‘’up’’ side coal sidings, the latter of which laid at forty-five degrees to the running lines. The yard’s connection with the running lines was not a direct one, and a reversal manoeuvre was required to access the sidings. The layout was controlled by a clapboard signal box, some two-storeys high, of typical SER design, and positioned just beyond the southern end of the ‘’down’’ platform. By the end of the 19th Century, the original footbridge had been removed, its replacement coming in the form of a lattice example. Whilst the staircases of this structure were of the common lattice configuration, the central span across the tracks consisted of simple horizontal bars (see pictures). The central section was possibly a later addition after a collision – it seems unusual to drastically change the design of the structure for just one span. The station saw a modest amount of modernisation under the Southern Railway; from 6th January 1935, electric formations began running through, with the extension of third rail from Orpington to Sevenoaks. The ‘’up’’ platform had been marginally extended at its southern end with prefabricated concrete in preparation for this, and about a decade earlier, a bridge for a public footpath appeared over the ‘’up’’ side goods sidings. Electrification also resulted in the construction of a two-storey high concrete substation in 1934, immediately behind the ‘’down’’ platform. An air attack in 1940 saw the footbridge damaged to the extent of it caving in on top of a stopping service, but within a few months, it re-appeared after being repaired offsite. Therefore today, it still remains ahead of the substation as the station’s oldest structure! Unintended structural destruction seems to be a running theme through this station’s history, as will soon be discovered. The staggered effect of the platforms was reduced in 1957, when lengthened occurred at their northern ends in readiness for twelve vehicle electric formations. Lengthening in the southward direction was prevented at this time by the presence of the signal box on the ‘’down’’ side, and the goods yard entrance on the ‘’up’’ side. Goods facilities were withdrawn on 18th April 1964, which allowed any future platform extension southwards, to proceed. The signal box also ceased to be a potential problem when it was burnt out in 1971, Orpington ‘’power box’’ taking over its functions from 13th May of the same year. The signal cabin had remained in existence up until this time to allow the reversal of two commuter services at the station in the morning peak. The main station building also suffered a fiery fate two years later, which led to its total destruction. During 1973, modernisation proposals were drafted for Chelsfield, and by the following year, an all-glazed structure based on the same basic design as those examples at Maze Hill and Dartford, had appeared on the ‘’up’’ side. To conform with the new ‘’modern image’’, the charming ‘’down’’ side waiting shelter was also dispensed with, and glazed bus shelters appeared on both platforms; the SER charm had now been lost. All that remained was the repaired footbridge, and the substation of 1935. In connection with the twelve-vehicle ‘’Networker’’ scheme mooted in 1991, both platforms were lengthened at their southern ends with prefabricated concrete, which eliminated all traces of the staggered arrangement.